Nearly all the content on web page is pure text - it may be formatted in different ways, but the web is mostly text; like most people, you have often found yourself landing on a website trying to search for a specific piece of information, namely (in most cases) some keywords you typed into a search engine that led you to that particular web page. Depending on the length of that page, the easiest way to find directly the information you came for in the first place would be to search the web page for a particular piece of text to find. Fortunately, Internet Explorer includes this functionality out-of-the-box, without the need to install any extension of add-on; in fact, the latest versions of Internet Explorer have improved this functionality quite a bit, as you'll learn in this tutorial. 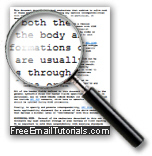 The following technique allows you to find text on a page, whether you are using Internet Explorer 8, Internet Explorer 7, or Internet Explorer 6. The only difference is that the process is more streamlined in the latest versions of Internet Explorer - whereas Internet Explorer 6 will open a plain search text box, Internet Explorer 8 will use an "incremental search" approach, where text found is highlighted as you type it in the search box, and will even give you a real time count of the matches it found on the web page. First, open your version of Internet Explorer; once in, load a web page of your choice (not an image site or Flash website, since you cannot find text in these media). Once the web page in question has loaded, press Ctrl+F on your keyboard. If you are using an older version of Internet Explorer, a "Find Text" popup will open: type the text you want to find, and hit Enter repeatedly, and each instance found will be highlighted in turn. There are several things to notice: first, we typed a sample search query inside the text field on the left; as we typed, words became highlighted on the web page. Whenever you hit Enter on your keyboard, Internet Explorer will also cycle in turn through the matches, and the total number of matches found on the page is indicated on the right side of the search bar ("5 matches", in our case). The "Previous" and "Next" buttons allow you to move up or down the web page (respectively), to go through each match found individually. If you enable "Match Whole Word Only" when you search for text, Internet Explorer will only find exact words matching what you typed in the search box. Here is a practical example: if this search option is turned on, typing "mail" will not match the word "email", but will only match the exact word "mail". And this is how you find text on a web page in Internet Explorer!